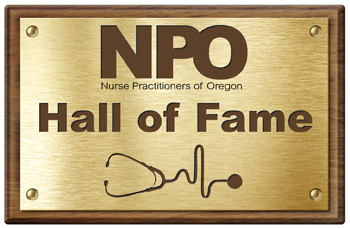 Founded 2015, the NPO Hall of Fame is meant to recognize and honor the lifetime achievements of NPO members, and other nursing advocates, who have made significant contributions to the nursing profession and the practice of nursing in Oregon. Anyone may nominate an individual to the NPO Hall of Fame. Nominees must meet the Hall of Fame’s eligibility qualifications to be considered. To nominate someone for consideration, you must complete the NPO Hall of Fame Nomination Form below. Nominations will close Aug. 1, 2018.